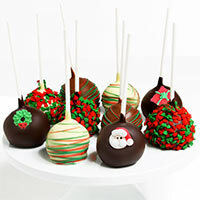 Spread Christmas cheer in the most delicious way with these elegant treats! We've taken a dozen classic Oreo® cookies and gently dipped them into baths of white, milk, and dark Belgian chocolates. Then, to make them festive, we decorated each cookie with sweet candy appliqués, pieces of wintry peppermint, or ribbons of silky confection. This gift arrived exactly on the day it was due to get there....My Mom waited and she absolutely loved the cookies, I wasn't happy with the shipping costs and wished there was something that could have been done about that, we are both elderly and live on limited incomes, but she was very happy said cookies were delicious. The cookies were very good and were gone in no time. I ordered the chocolate covered oreos and my aunt had them with in five days.